The call for prescreened A+ blood came over the PA system and the soldiers ran to the Aid Station. While it's not an everyday occurrence you get used to it, like the sound of helicopters, gunfire and controlled detonations. Later I found out there was a Ramp Ceremony. You never get used to a Ramp Ceremony. SPC Dennis Weichel died here on FOB Fenty after being brought in to the Trauma Center where the surgical team worked on him. SPC Weichel had been crushed by an MRAP (Mine Resistant Ambush Protected) vehicle that weighs in at 36,000 pounds pushing a child from it's path. SPC Weichel was with the Rhode Island National Guard and this was his second deployment. His civilian profession was as an outstanding employee of the McDonalds Corp as a Restaurant Manager. Here his unit arrives from FOB Methar Lam in Laghman Province for the ceremony. SPC Weichel leaves behind a family including three children. Writers note: There is an investigation pending which is why I didn't write about this sooner. As a media embed I must wait for the release from the PAO office and out of respect for the family members. This is the perfect time of year to come to Afghanistan. 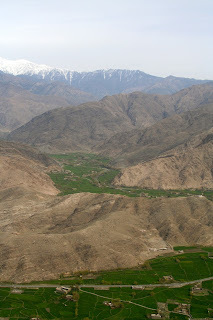 The valleys are green and lush and it's warm, but not blistering hot, like it will be in about two months. 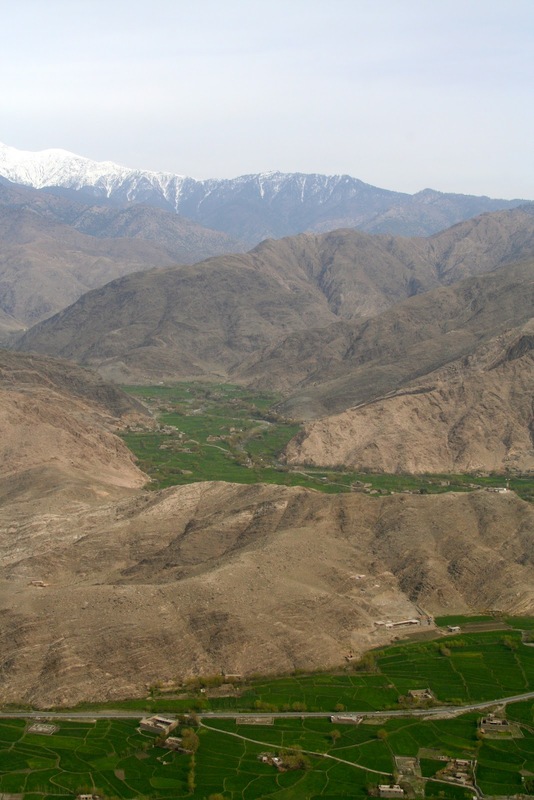 If only Afghanistan would trade Tourism for Terrorism their economy would flourish, there would be no need for opium fields and Taliban and our military could pull out entirely. 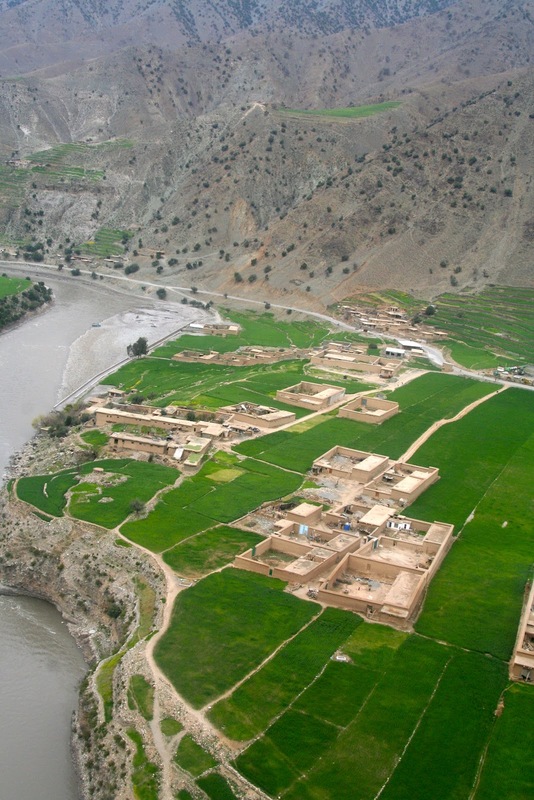 These photos are of the Pesh Valley...as I've said before, beautiful and deadly. But on this day, peaceful. I saw children playing cricket and running around having outdoor fun, like children in America did before computers. If you look closely you can see the snow capped mountains. This was one of those days that couldn't be better. 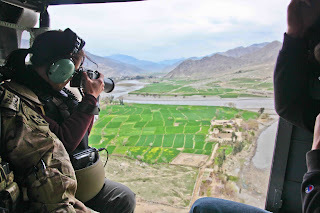 We have to remember and make note, this valley wasn't so peaceful a couple of years ago, but thanks to the US military there are days like today. Yesterday I had the opportunity to travel around a bit to different Outposts. My first stop was COP Bostick: Have No Fear. 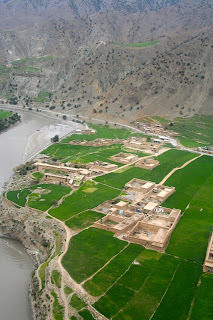 It is in a remote mountain location, that was absolutely beautiful to fly too. In war beauty is usually synonymous with deadly and this was no exception. I was there for the TOA ceremony. I met up with 1LT Marissa Readinger who I wrote about in a prior blog. Security is always an issue at a TOA as we all walk around slick. Spl Ikrom Omonov from NY, NY had us covered. Here he is setting up a satellite antennae. The changing of the flags, the COP transferred from the Wolfhounds to the Red Warriors. During a TOA (Transfer of Authority) things get a little backed up. When I got here soldiers were sleeping in the gym. Some of them are sleeping on the LZ. Watching guard is: SPL Lucas Wall from Hawaii. He spent his time on COP Penich. If you look closely, he isn't guarding just gear, but most of those lumps are soldiers. Here is the inside of my Transient Tent. There are female soldiers coming and going at all night time and early morning hours. Here is Sgt Helen Stidhan, on the left, who I interviewed on the way in last year. She's from Ft. Worth, TX and her pride and joy is her dog Rifle. Sgt Felicia McCorkle, on the right, from Salisbury, NC has a handsome family of 3 sons. Both have served 3 tours. 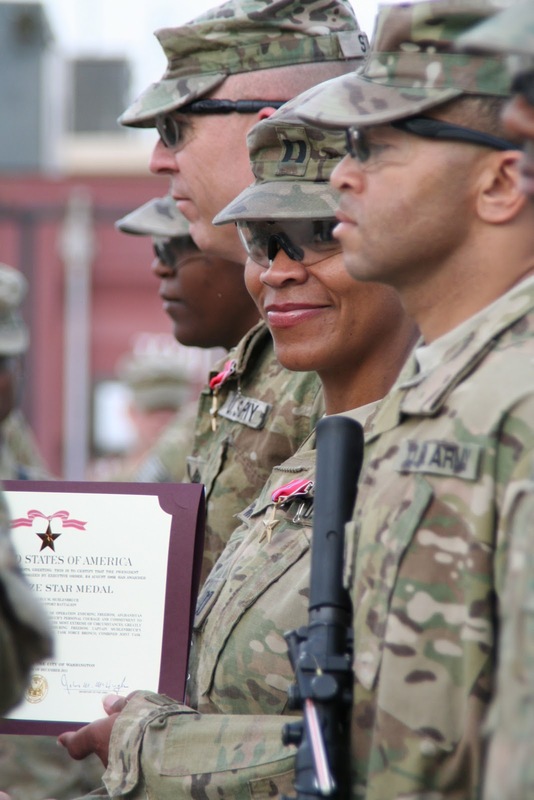 Sgt Stidhan received a Bronze Star. Both are 88mikes...(transportation) getting supplies out to the soldiers on the COP's. At the end of the tour all the battalions have an award ceremony honoring their soldiers based on their scope of responsibility throughout the year. 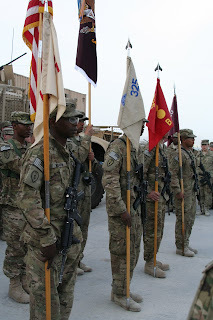 This award ceremony was for the 325th BSB or Brigade Support Battalion. They are the soldiers out of the wire, transportation and logistical specialists, (sling loading supplies into COPS), running the medical facility etc. They risk their lives and get paid 1/3 of what we pay civilian contractors.